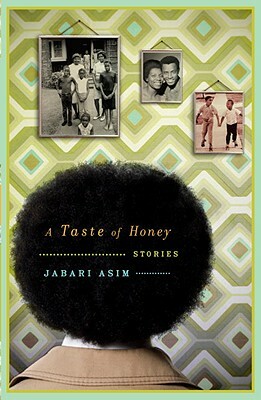 A Taste of Honey, by Jabari Asim, is one of those books I just found by browsing the library. I picked it up because it was on display at the library (which always gets me! If a librarian likes a book enough to give it prominent display, it must be good, right?). It has such an evocative cover, and I am trying to read more short stories, so this was perfect. A Taste of Honey is set in a Black neighborhood of a fictional Midwestern American town during the late 1960s. While there are stories that reference and center on the racial tensions and fear that you would expect from a set of stories about America in the 1960s, there are also many stories that center on small but beautiful things that happen in the many characters' lives. A Taste of Honey combines the best aspects of short stories and novels, I think. As a collection of short stories, it focuses on emotion and capturing a moment rather than on developing a complex plot. But as all the stories are set in the same town, and many of them involve the same people, readers end the collection feeling connected to and fond of not just the stories, but the characters that populate them. I loved ending one story with Crispus' point of view and then picking up the next one, a moment later, from his older brother's perspective. I learned so much about everyone, and this was one of the strongest points in this story collection, though there were many strong points. I don't like to review short stories as individual units. And in this book, particularly, when all the stories are so interconnected and reference each other, it really is such a treat to follow the trail yourself. My favorite aspect of these stories is that they present a well-developed, tight-knit and strong community that works together to overcome obstacles and help each other. No one is perfect, and some terrible things happen, but overall, people care for each other and help out. The cover art shown here, of a boy looking up at photos of his happy family, is very evocative of the stories that populate this narrative. In my urban existence, much of that sense of community is gone. (Though I do glimpse it from time to time in the winter as complete strangers offer their help to push other people's cars out of snowbanks.) But here, it's alive and well and a force to be reckoned with. There really are no secrets in this town, and so not only do readers get peeks behind the curtains of these characters' lives - the other characters in the book get the same peek. And with such a tight-knit community as the background in these stories, the reader truly gets to know so many of the characters. The character who pops up in most of the stories is Crispus, a 9-year-old named after Crispus Attucks, the first casualty of the American Revolution, and who has a crush on a chubby girl and is afraid of the dark. We hear a lot of stories from Crispus' point of view, but then we also learn about Crispus from his father's, mother's and older brother's perspective. It's so sweet to see how an older brother worries about his younger brother and tries subtly to care for him, even when no one else notices. It's these little touches that made this collection come to life for me. Such a pleasure. I love a short story collection that hinges on a community or a common theme. This looks fab. I love collections like that, too! I really enjoyed this one. And wow, way to get right back on with blogging after your wedding :-) Hugs! Every since reading Anderson's Winesburg, Ohio, I have loved collections centered in a specific community, so this sounds awesome to me. This sounds wonderful. I do love short stories that connect with one another. I recently read a collection like this by Maeve Brennan that was wonderful. I remember seeing this book years ago. It sounds wonderful, a book that really comes together for readers. I am not terribly fond of short stories, for reasons that are too numerous to really get into in a comments section! But this... this might break me of that, so perhaps I shall give it a shot. Lovely review. Aw, a kid named Crispus, that is sweet. Okay, I don't usually like short stories, but I may give these a try anyway. I am won over by the sweetness of a child being named Crispus. Given that I like short stories but often feel disappointed when they end, I'm drawn to this for the connections. They sound far more connected than most. Onto the list! That is what I am here for! :). Hope you like them! I really enjoyed this one.